Easterday Construction Co., Inc. has been a Butler Builder for over 25 years and has installed over One Million Dollars worth of their product. See our Projects Page for pictures of some of our completed projects. Easterday Construction Co., Inc. is an authorized dealer for Generac Power Systems as of 2006 and we have begun selling back up generators as part of our product line. Contact us for information about backup power systems for your home or office. Easterday Construction Co., Inc. is a strong supporter of ABC and the Merit Shop Philosophy. We are members of the Michiana Council and hold a board position at the State Level. Easterday Construction Co., Inc. is a long standing member of the National Federation of Independent Businesses. We have been active members and have held board and committee positions in past years. Easterday Construction Co., Inc. is a long standing member of the U.S. Chamber of Commerce. We are proud to support this organization in its many stances promoting business interests. Easterday Construction Co., Inc. is a member of the Culver Chamber of Commerce. Our personnel have held Board positions and have been Chamber Officers over the years. We have supported the Chamber in many endeavors. We were instrumental in the origination of the Second Century Committee, a subcommittee of the Chamber that has been responsible for many of the major changes in Culver including a design charrette and a new Comprehensive Plan. 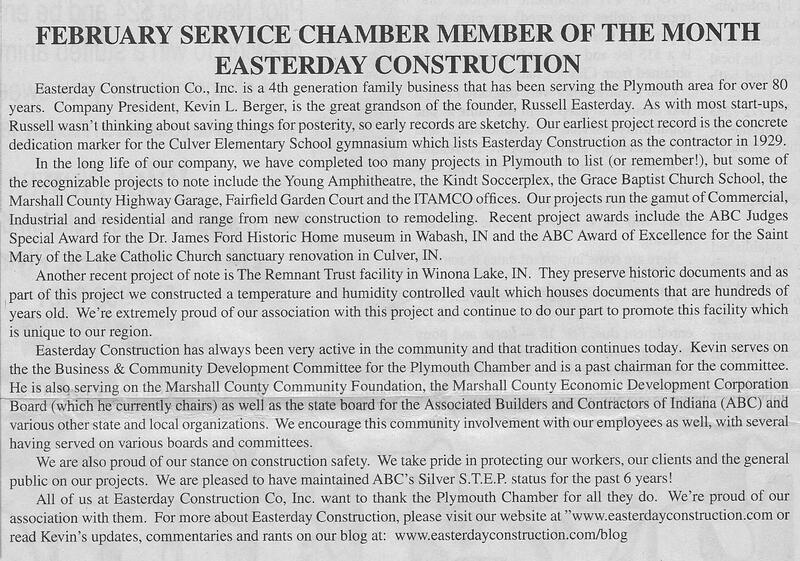 Easterday Construction is a member of the Plymouth Chamber of Commerce. Our personnel have held Board Positions over the years. We support the functions of the Chamber and appreciate their efforts in the community. We were named Service Member of the Month in the January 2013 Plymouth Chamber of Commerce Newsletter and in a Chamber Chatter ad in the Pilot News. Easterday Construction Co., Inc. supports the Lake Maxinkuckee Environmental Council and has had personnel holding positions on the Council and the Lake Maxinkuckee Environmental Fund. ECC personnel have held Board positions in both organizations and strongly support their positions on preservation of the lake.